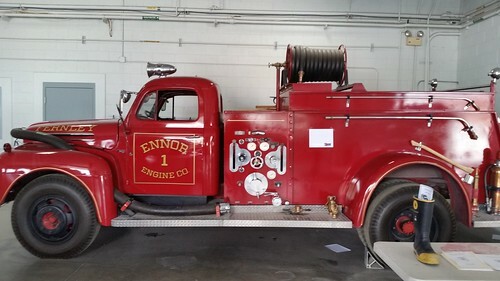 Saturday afternoon, the North Lyon County Fire Protection District held an Open House. Lisa and I walked over to support our local fire department. NLCFPD was founded in 1952, significantly predating the 2001 incorporation of the city of Fernley. It's a separate agency that is effectively the Fernley Fire Department but is not managed by the city itself, but by a separate board. 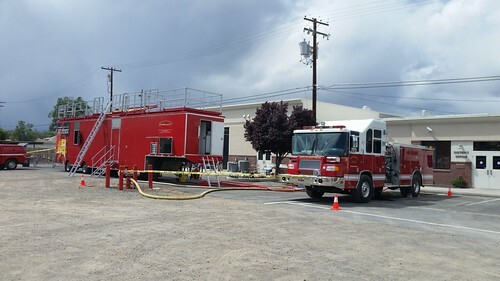 Parked out back was one of the fire trucks, being used as part of the demonstration of the fire-training trailer. 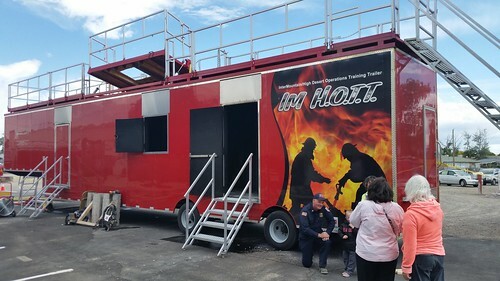 This trailer, funded by a consortium of northeastern California cities and on loan to Fernley, is used for fire training exercises. Inside are various sorts of simulated situations you might find in a house fire. At right is the NLCFPD Chief posing with one of the many children who were at the event. Lisa and I really like our fire chief, who is a good man working with insufficient resources. 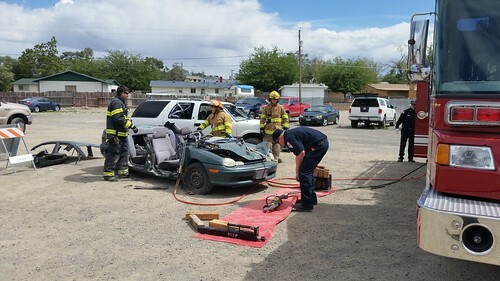 The crews demonstrated using the "jaws of life" and other equipment to do rescues from wrecked vehicles. This was a multi-agency affair. 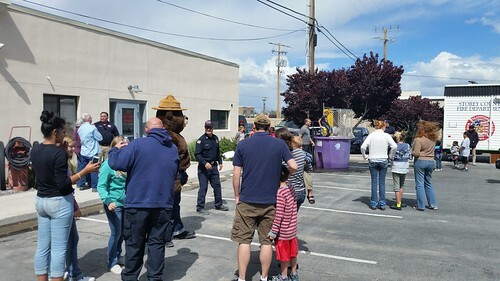 The US Forest Service sent Smokey Bear (here watching people taking turns at the dunking tank), neighboring Storey County sent a home safety training trailer (visible at right in this photo) and the Bureau of Land Management (who stations a fire crew in Fernley during the fire season) fire services were present as well with material about keeping homes in fire areas safe. BLM (yellow truck in the distance) stations a crew in Fernley during the fire season. They supply the crew and NLCFPD provides room and board. This is important because the NLCFPD (like Fernley itself) is checkerboarded with BLM land, and wildfires do not respect political boundaries. This whole area is still to this day a patchwork of public and private land as a legacy of the Central Pacific Railroad land grants that helped fund the building of the original transcontinental railroad. There is a measure on the local ballot here to increase property taxes to fill critical funding needs for our understaffed local fire department, which finds itself stretched and sometimes unable to answer all calls. 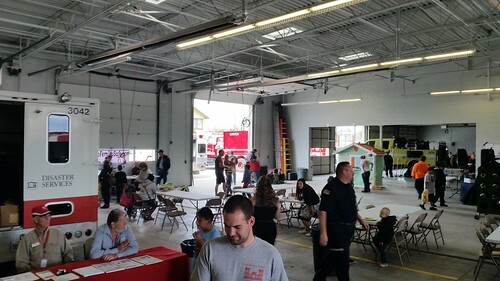 Fortunately, there were no calls during Saturday's open house, and the open house itself was funded by an outside grant, not by fire department funds.